At least 50 years ago, optical equipment riding on U.S. reconnaissance aircraft could read a license plate from 80,000 feet, but to inspect something a lot closer—say, the hardware 30 feet overhead atop a utility pole—you just had to climb up there and look. The high-resolution camera is clearly seen, attached underneath the UAS. Gradually, that irony is fading away. For decades, “eye in the sky” has been a familiar name for the U-2, the SR-71 and various orbiting satellites, but now, smaller, vastly less expensive eyes in the sky are beginning to define an important role in day-to-day utility operations, boosting the efficiency of reliability-enhancing inspections and maintenance and helping reduce the hazards associated with that work. Since November, Adams-Columbia Electric Cooperative has been working with Prairie du Sac-based Edge Consulting Engineers, participating in discussions and field demonstrations to assess the utility-relevant capabilities of unmanned aircraft. A December visit to an Adams-Columbia employee meeting found enthusiasm running high. The helipad isn’t just for looks. 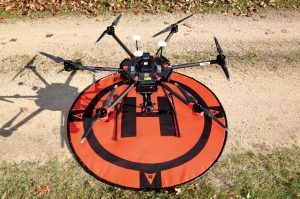 On sandy or debris-covered surfaces, the six rotor blades could whip up a little storm of projectiles that might damage the camera or other sensitive UAS equipment. 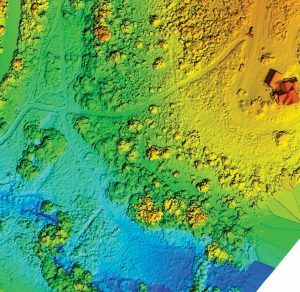 They’re commonly called drones, but those who know them best and operate them on a professional basis prefer UAS, for Unmanned Aircraft Systems, or UAV, for Unmanned Aerial Vehicle. By whatever name, the devices are increasingly popular among hobbyists, and increasingly practical in terms of making serious and sometimes difficult jobs easier to perform. Charlie Toms is the UAS project manager for Edge Consulting. He’s been a UAS hobbyist and certified pilot for more than a decade (Edge has three) and sits on the State of Wisconsin UAS Advisory Board, which acts as a resource on UAS operations for state agencies, utilities, other companies, and hobbyists. Toms is no stranger to electric cooperatives. 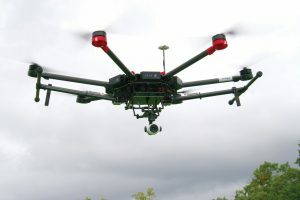 Prior to his joining Edge, Charlie and a colleague were contracted by the National Rural Electric Cooperative Association to write a technical paper about utility-applicable uses of unmanned aircraft and what’s required to conduct those activities within the bounds of safety and regulatory considerations. 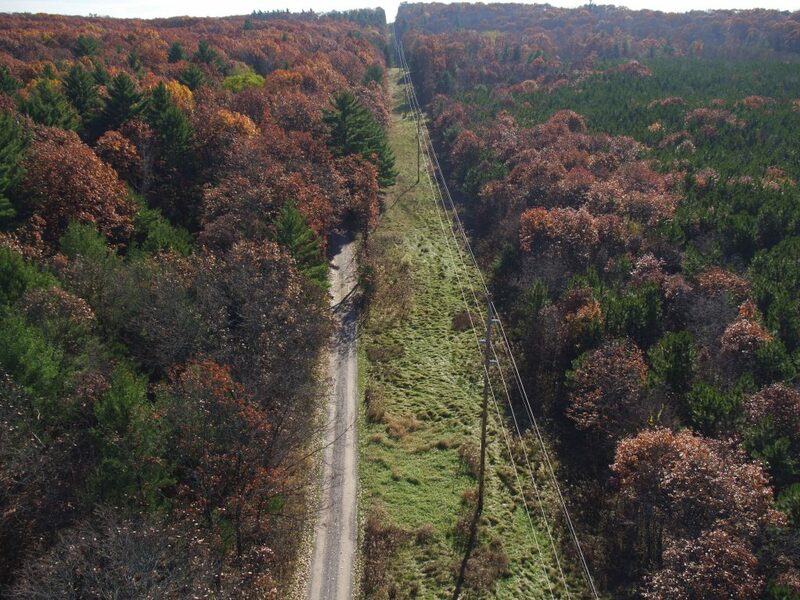 A bird’s-eye view of a power line right-of-way. 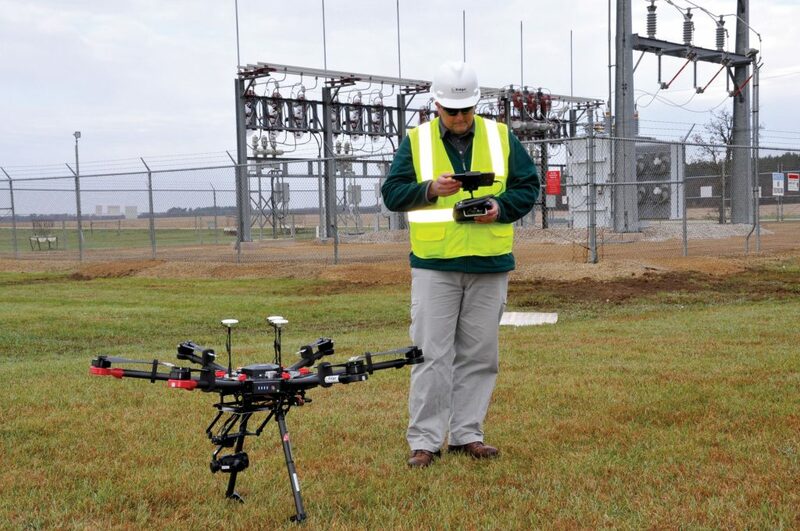 Recently, his firm has been donating its time and resources to provide demonstrations for Adams-Columbia, building the foundation for a clearer understanding of how UAS technology can be helpful to power utilities. An initial demonstration took place in the Coloma and Wisconsin Dells areas during November. 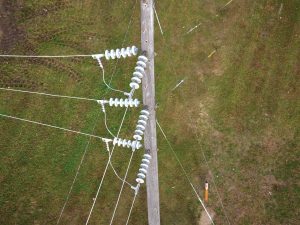 In an era when problems on an electric distribution system are increasingly easy to locate, nobody needs UAS technology to tell them when a line is down. What is useful is the enhanced ability to efficiently examine infrastructure that’s working just fine, to keep it that way. 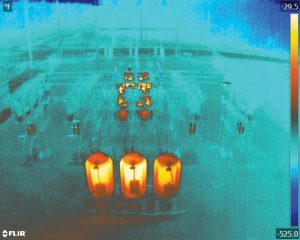 Hovering above an Adams-Columbia substation, the thermal camera reveals what’s hot and what’s not. Speaking of a “safe and efficient trip,” Toms makes it clear the emphasis belongs on “safe,” especially in light of the proliferation of unmanned aircraft during recent years. Proper pilot training is a concern he says may often be overlooked. Some functions can be performed on autopilot, but a qualified operator is needed to ensure safe operation. There would be no surprises waiting if a mineworker needed to make repairs at the top of this power pole. The first thing that’s apparent looking at photos from the November demonstration is the striking clarity and detail of the images. If there’s a need to actually ascend a pole, there’s no doubt the lineworker will know very clearly what’s up there. But then there are other things no lineworker can see with the naked eye. Toms explains, “Our particular aircraft has a very accurate high-resolution thermal camera,”—a “gimbal stabilized FLIR High Resolution Radiometric Thermal Camera,” meaning it can produce very accurate thermal imaging that will confirm whether electrical equipment is properly shedding excess heat—or not. An orthomosaic map can be used, among other things, to update Google Earth. The 3D model makes it possible, for instance, for the co-op to make measurements in planning future modifications to a substation, and the model is accurately georeferenced, meaning it’s accurate in terms of the actual facility’s position on the planet. Co-op employees can use the model to design changes to a substation without having to go there, and still be confident that what they’ve planned will fit the physical circumstances of the facility. 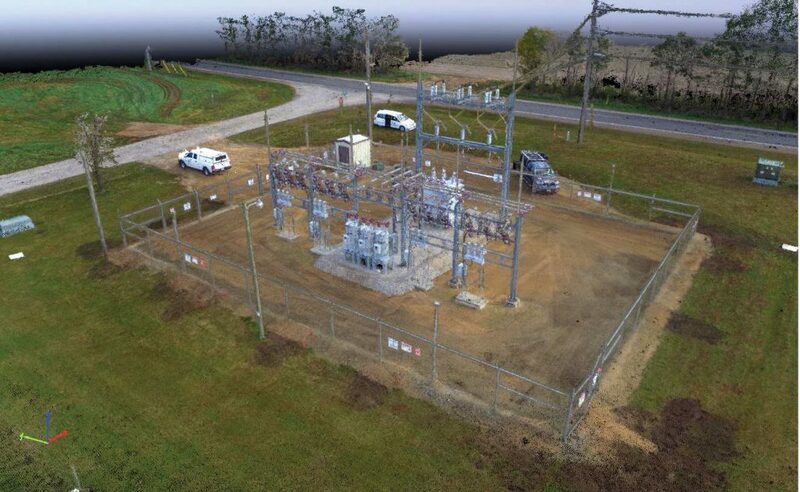 It’s not what you think: The image is not of the substation itself, but a strikingly accurate 3D model. Demonstrations at Adams-Columbia are ongoing. It seems safe to say new possibilities will be found, with high prospects of enhancing the efficiency and safety of utility operations using the little eye in the sky. Photos courtesy of Adams-Columbia Electric Cooperative and Edge Consulting Engineers, Inc.